The walnut is a popular food for its nutty taste and its nutritional value, but it also has a long history of valuable medicinal uses. Native to ancient Persia, walnuts have been a popular component of the human diet for thousands of years. They are one of the oldest tree foods, with some varieties dating back to approximately 7000 BCE. Today, walnuts can be found in most parts of the world thanks to extensive trade. As well as providing several key nutrients, the walnut possesses several significant health benefits that make it a valuable plant. Lowering cholesterol. Walnuts help decrease levels of cholesterol in the body while also improving the ratio of good to bad cholesterol. Protecting the heart. By reducing inflammation in the heart, walnuts can reduce the risk of disease and damage. Reducing risk of infection. Walnuts contain compounds that effectively inhibit growth of several bacteria and fungi. 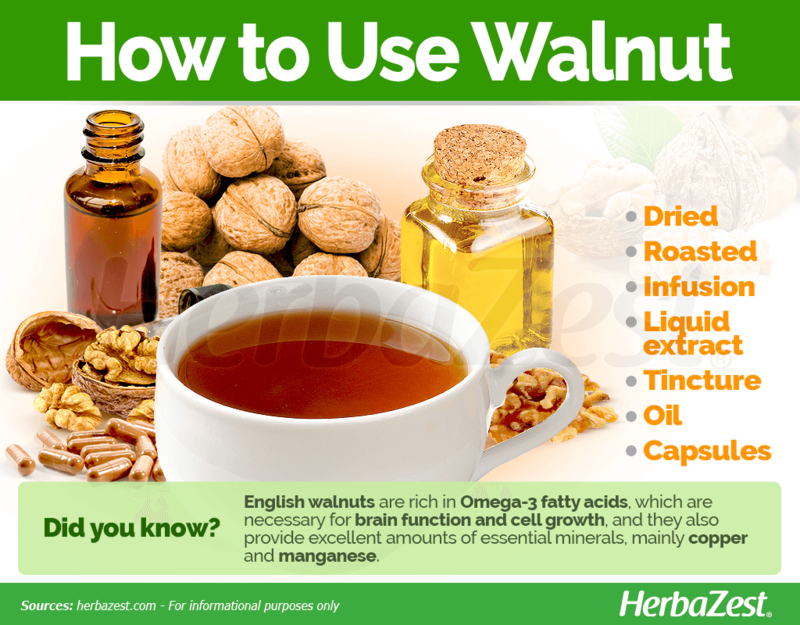 One of the most impressive medicinal properties of walnut lies in its cholesterol-lowering action, which is thought to be related to the high levels of omega-3 fatty acids present in walnut nuts. These fatty acids also play a role in heart health, as lower levels of cholesterol reduce the risk of heart disease. Additionally, walnuts contain ellagitannins, which reduce inflammation in the heart, thus preventing the development of heart disease. The strongest antimicrobial substance in walnuts is thought to be juglone, which shows an inhibitory effect on several types of bacteria and fungi. Other herbs, like avocado, flax, olive, and sacha inchi are also great for lowering cholesterol levels. The walnut fruit is considered generally safe for consumption, although in medicinal amounts it may cause some unwanted effects, such as diarrhea and bloating. Walnut consumption may cause allergic reactions in people sensitive to tree nuts, including rash or difficulty breathing. Walnuts have no known interactions with medications. However, pregnant or breastfeeding women should refrain from eating these and other tree nuts in medicinal amounts, as their effects on child development has not been extensively studied. 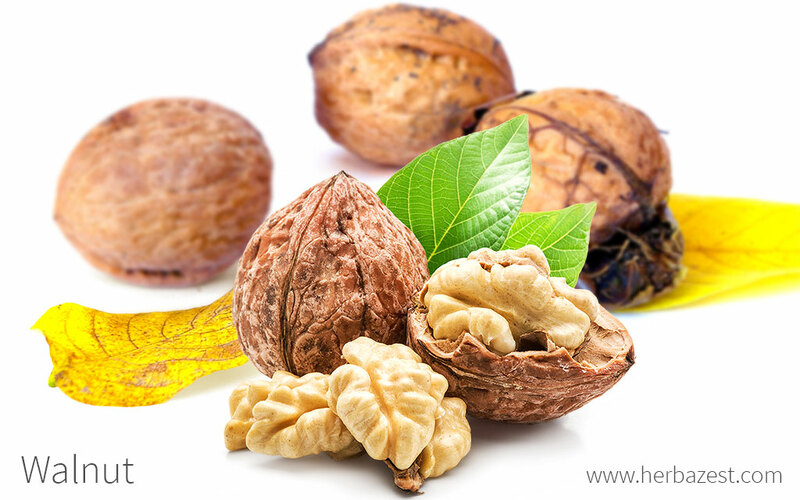 The widely popular English walnut (Juglans regia) is rich in Omega-3 polyunsaturated fats, which are necessary for brain function and cell growth, and it also provides adequate amounts of protein and dietary fiber. As other tree nuts, English walnuts are powerhouses of essential minerals, providing excellent amounts of copper, which plays a key role in the production and transport of red blood cells, as well as manganese, a mineral that promotes carbohydrate metabolism and calcium absorption. Walnuts are also a good source of magnesium, which is necessary for muscle and nerve function, and provide adequate amounts of iron, phosphorus, and zinc. The nutritional value of the English walnut is rounded by fair quantities of B complex vitamins, mainly B1 (thiamin), B6 (pyroxidine), and B9 (folate). 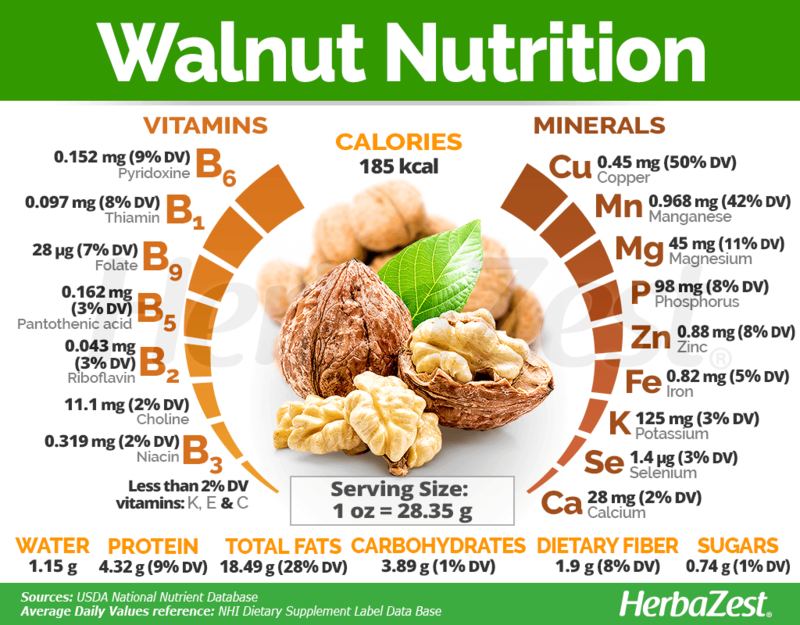 An ounce of walnuts (28.35 grams or 14 halves) provides 185 calories and 8% of the daily value for dietary fiber. The dried fruits of the Juglans tree can be eaten alone, either raw or roasted, as a healthy snack. They are also commonly added to recipes - anything from salads to meat dishes to pastas - and are popularly used in desserts for a nutty and healthy addition. Although they are widely popular snacks, both English walnut and Black walnut medicinal uses include many herbal preparations in order to fully reap the health benefits of these tree nuts. Raw or roasted. Walnuts are popularly consumed as a snack, alone or mixed with other nuts and dried fruits. However, packaged nuts are often high in sodium, and unsalted alternatives are considered much healthier. Infusion. The leaves and fruits of the walnut tree can be brewed. This warm infusion is especially useful for protecting the heart. Tincture. A product of macerating the leaves and nuts of the Juglans tree in alcohol, this preparation highly concentrates the medicinal properties of walnut. Few drops of this tincture diluted in water can help lower cholesterol. Liquid extract. 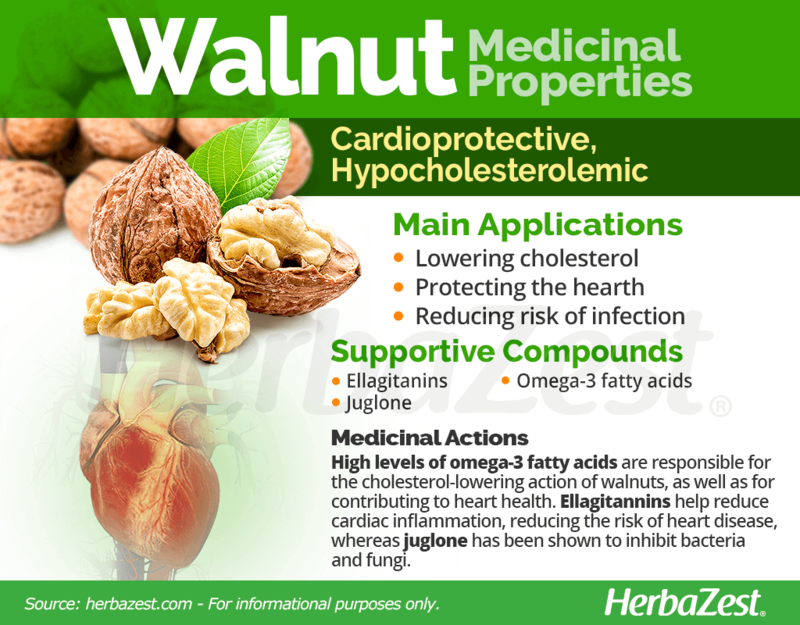 Walnut extract is a strong remedy that can be applied externally to reduce the chance of infections, or taken orally to promote cardiovascular health. It can also be used as a natural flavoring for culinary preparations. Oil. Often used in massage therapy, walnut oil has strong antimicrobial properties and can be used to help fight infections when applied externally. Capsules. 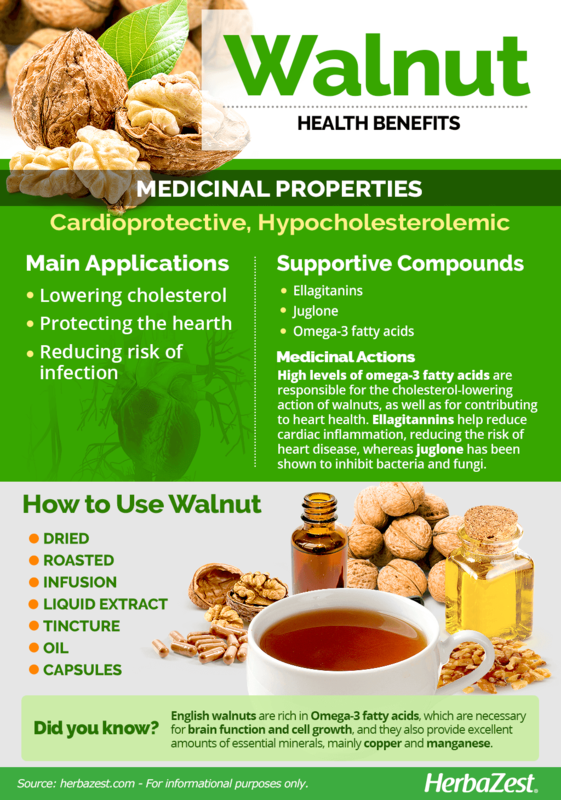 An excellent way to obtain the cholesterol-lowering properties of the Juglans nut is taking walnut capsules, which come in convenient, fixed doses. The black walnut is most commonly used in medicinal preparations. Fresh, raw, roasted, or salted walnuts are readily available at most supermarkets. They may also be found at local markets or ordered online. The English walnut (Juglans regia) is difficult to find in supplemental form, although some online herbal stores may have these forms. However, the closely-related black walnut (Juglans nigra) is popularly used in medicinal preparations, mainly liquid extract, and remedies made from this walnut can easily be found at major online retailers or local health stores. Juglans trees have lifespans that may surpass 200 years, and they can take up to a decade to produce quality harvests, so planting a walnut tree is a long-term commitment. Additionally, walnut trees can cause damage to plants growing nearby by releasing juglone - which is toxic to certain plants - so they should be situated far away from vulnerable plants. Walnut trees can be propagated by seed, but they are much more likely to be propagated by seedlings. It is best for the seedlings to be one year old before being planted outdoors. Walnut seedlings should be planted in well-drained soil that has at least five feet (1.5 m) of depth for the walnut tree's roots to grow. Juglans trees can tolerate a wide range of pH levels, but they prefer a pH of 6.5 - 7.5. It is recommended to space the seedlings 30 - 60 feet (9 - 18 m) apart. Walnut trees thrive in temperate regions; harsh winters will damage the plant, and early frosts may kill developing blossoms. However, temperatures above 100°F (38°C) may decrease the quality of the harvest. All Juglans species should be watered frequently, and a large walnut tree may need up to 40 gallons (150 L) of water per day. Manure may be used as fertilizer once the walnut tree has matured. Weeds growing around the tree should be manually removed to eliminate competition for resources. The walnut tree should be pruned in winter to remove dead branches and ensure sunlight can reach all parts of the tree in spring. The walnut fruit matures during the summer and is ready for harvest by fall. Walnuts can be harvested by shaking the tree and collecting the nuts that fall to the ground. Moths, scale insects, and aphids are some of the most likely pests to damage Juglans trees. Anthracnose and walnut blight are common diseases of walnut species. Further information on growing walnuts can found in the herb garden section. The walnut tree (Juglans spp.) is a deciduous, monoecious species that usually grows 40 - 65 feet (12 - 20 m) tall, but can reach heights of up to 80 feet (24 m). Its bark is brown or gray, both smooth and fissured. The walnut fruits grow from flowers in bunches of three to nine, and are about one to two inches (3.5 - 5.0 cm) in diameter. Walnuts are members of the genus Juglans, within the family Juglandaceae. From out of the approximately 50 species in this family, 21 trees fall under the genus Juglans. Other important genera in this family are Carya, which include pecan; and Castanea, represented by chestnut. The Persian or English walnut (Juglans regia), considered as the common walnut, is native to southeast Europe and parts of southern Asia. However, other notable walnut species are the black walnut (J. nigra) and the white walnut (J. cinerea), both of which are native to North America. The English walnut (Juglans regia) is also known as Persian walnut because this Juglans species originated in ancient Persia, and their cultivation can be dated back as far as 7000 BCE. They were traded along the Silk Road and were popular with the ancient Romans, who gave the nut its name - Juglans regia, or "Jupiter's royal acorn." Persian walnuts became known as English walnuts due to England's role in spreading them throughout the world through trade with their colonies. Franciscan monks were the first to cultivate walnuts in California, in the 1700s. Black and white walnuts, both native to North America, have a sparser history because of the lack of written records concerning their use among Native Americans. The English walnut, J. regia, is an economically-important crop. In 2014, the top five producers of walnuts were China, the United States, Iran, Turkey, and Ukraine. China was the top producer among these five countries, producing 1.6 million tons of walnut nuts. The United States is the largest exporter of walnuts, and the vast majority is grown in California. Black walnuts, J. nigra, are not commonly grown commercially outside of use as for herbal remedies and food flavoring. Holding walnuts and playing with them in the palm of the hand is a type of status symbol in China, and unique walnuts, such as those carved with intricate designs can cost tens of thousands of dollars. Dye. The brown dye obtained from walnut fruits was used in Europe in Medieval times for cloth and hair dyeing, as well as for making a high-quality ink for writing and drawing. Carpentry. The wood of the walnut tree is also a popular choice for making furniture. Cosmetics. The essential oil extracted from walnuts is also used in some cosmetic products. Walnuts are a healthy and delicious snack that provides a range of significant health benefits. They are easy to find worldwide and are available in a variety of medicinal preparations that provide all their hypocholesterolemic and cardioprotective benefits.